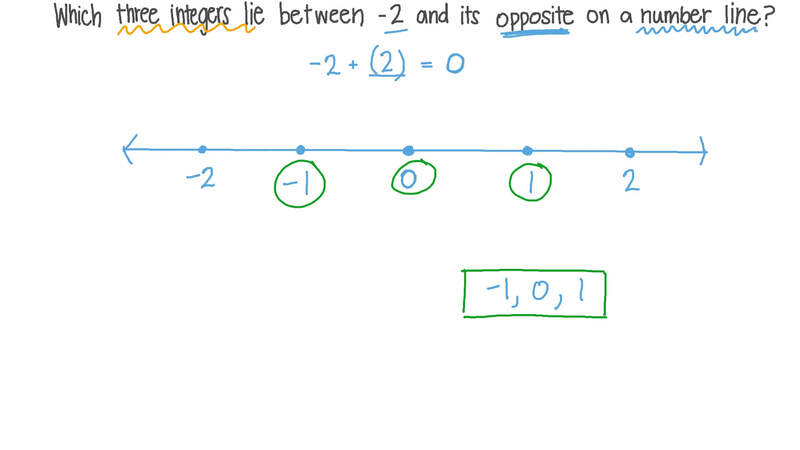 In this lesson, we will learn how to graph an integer on a number line, write its opposite, and derive the relationship between that integer and its opposite. What number is the opposite of negative nine? Which three integers lie between − 2 and its opposite on a number line? On a number line, which integer is halfway between any number and its opposite? What is the opposite of zero? Nabil knows that is 5 units to the left of zero on a number line, and that the opposite of is 5 because it is the same distance from zero in the opposite direction. What is the relationship between and the opposite of 5? Two numbers, 𝑎 and 𝑏 , are opposite one another. If 𝑎 is 3 units to the right of 8 on a number line, determine the value of 𝑏 . The freezing point of water is 0 ∘ C , while its boiling point is 1 0 0 ∘ C . If we represent these temperatures by integers on a number line, will they be opposites of each other? Select the number line which contains opposite quantities that add up to zero. Answer the questions about the points on the number line. What distance away from zero is the selected number? If you start at the selected number and move toward zero, do the numbers get smaller or larger? If you start at the number that is opposite the selected number and move toward zero, do the numbers get smaller or larger? The integer is the opposite of 7 because they are the same distance from 0 on a number line, but in opposite directions. Engy wrote that the opposite of is , what number is this? Use the number line to choose the smaller of the two numbers. Remember that numbers get smaller as you move to the left. Which of the following will you get if you add A and B? Determine whether the following statement is true or false: The opposite of the opposite of a number is the original number. The city of Brawley in California has an elevation of 111.9 feet below sea level. Write a number that represents the elevation of the city. If we plot the opposite of this number on a number line, between which two integers will it lie? 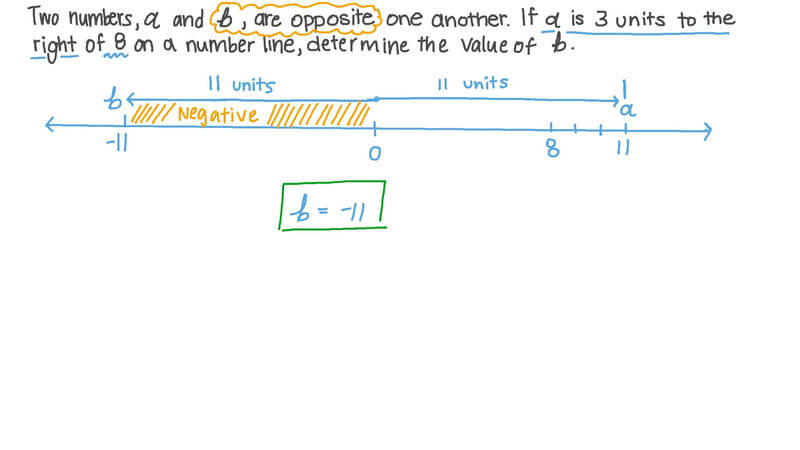 In the following number line, find the value of the opposite of point A so that their values add up to 0. A class were using number lines to find the opposite of a number by looking at the distance from zero. 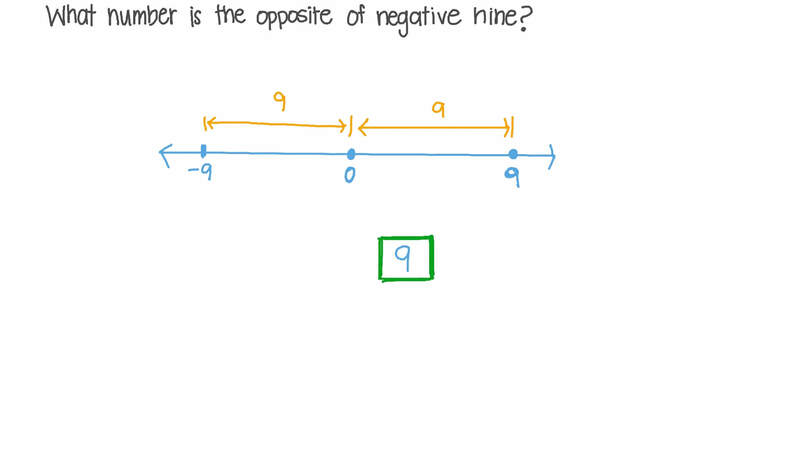 After doing some examples, a student said “the opposite of the opposite of a number will always be negative”. Is this true or false?